A 45‐year‐old man suffered a left knee gunshot wound 3 months prior to presentation. 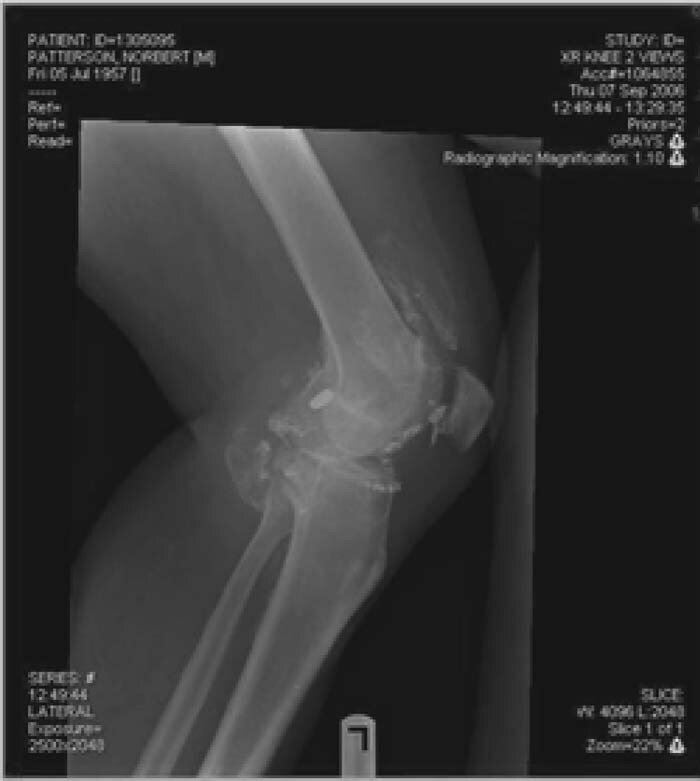 His physical examination and radiograph revealed an unfragmented bullet in the left knee synovium. Pertinent laboratory data revealed a hemoglobin of 12. Neurovascular compromise was not present, and the patient was subsequently discharged without operative intervention. Two months prior to admission, the patient complained of increasing fatigue and depression. Evaluation revealed a hemoglobin of 8 with microcytic anemia. The patient was placed on iron supplementation without further diagnostic workup. On the current presentation, patient complained of continued fatigue, and diffuse, nonspecific abdominal pain. Laboratory data revealed the continued presence of anemia despite the iron therapy. A peripheral blood smear showed basophilic stippling. Repeat imaging of the left knee showed wavy opacities emanating from the bullet in the left knee synovium. The patient's serum lead level was 190 μg/dL. The patient was diagnosed with lead poisoning secondary to a retained bullet. His symptoms improved after chelation therapy and removal of the bullet. After bullet removal, the patient's serum blood level was 60 μg/dL. Our case demonstrates that lead poisoning can occur in patients with an unfragmented bullet in as short a time as 3 months. The most common sources of adult lead poisoning are environmental (fumes), occupational (plumbers, shipbuilders) and recreational (moonshine, gasoline sniffing). Although commonly ignored, there exists extensive documentation of lead poisoning from retained bullets (Journal of the American Medical Association, 2003; Trauma, 2001) Chronic plumbism may be considered in patients with retained lead shrapnel, and a history should be taken to assess the presence of symptoms referable to plumbism. Predisposing factors for lead poisoning from a retained bullet have been documented to include: fragmented bullets, which increase exposed surface area of lead; bony fractures, which increase exposed bony surface area to lead incorporation leading to chronic lead leeching; and lodging in articular spaces (synovial pH facilitates solubilization of lead). All patients with gunshot injuries should be screened for the signs and symptoms of lead toxicity. The individual risks for lead toxicity from retained shrapnel should be assessed in each gunshot victim. Significant morbidity can result if clinicians do not suspect lead toxicity in gunshot victims. C. Ukpong, MD, none; D. Sirakov MD, none; T. Desai MD, none. Ukpong C, Sirakov D. Get the Lead Out. Abstract published at Hospital Medicine 2008, April 3-5, San Diego, Calif. Abstract 186. Journal of Hospital Medicine. 2008; 3 (suppl 1). https://www.shmabstracts.com/abstract/get-the-lead-out/. Accessed April 22, 2019.